2015 saw thrashing rage come of age once again! Another year almost over and another end of year list! Well this one’s for the thrashers and while The Big 4 were relatively quiet (Slayer withstanding), the underground – and particularly the UK – were releasing quality new material at a rate of knots. Bands reformed, bands solidified their position as genre legends and modern thrash could once again lay claim as being the single greatest sub-genre in metal! Instead of trying to cram these exemplary releases into an all genre encompassing ‘best of 2015’, a countdown celebrating nothing but thrash seemed prescient and so – with much squabbling and general disagreement as to what should make the cut – these 10 releases were considered the greatest thrash releases of 2015. Disagree? Pop your alternatives in the comments below. Let’s thrash! Must hear track: “Architects”, gloriously choppy riffs don’t come much choppier! Overflowing with Angelus Apatrida’s reliable intensity, album number 5 from Spain’s finest thrashers remained on Worship Metal’s playlist for nigh on a year and if that doesn’t stand as testament to it’s quality then nothing will! Playing with a fierce technicality and proficiency that recalls genre greats Artillery, Heathen and Forbidden, the Spanish thrash metal titans have plyed their power/thrash metal trade for 15 years now but, if anything, Hidden Evolution is an indication that they’re just getting started. Like overly polished metal, there’s a sheen, yet deadly sharpness, to Angelus Apatrida’s songwriting. The tech thrash havoc caused by “Immortal” and “Serpents On Parade” gleaming incessantly yet operating with a serrated edge that satisfyingly scratches that thrash itch that just won’t quit. In fairness, Hidden Evolution is how the latest Annihilator album should have sounded, melodic yet never ‘soft’, its groove element adds to the overall feel that Angelus Apatrida have settled in to a ‘groove’ of their own; content to vary their considerable array of styles within each song, producing highly memorable tracks in the process. 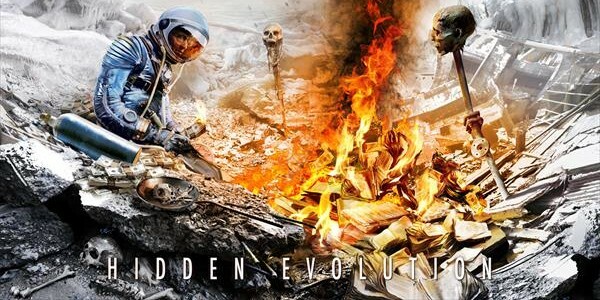 Ending on a Testament-styled high with the epic semi-balladry of the 9 minute title track, Hidden Evolution is an exceptional album from a band who appear to know when they’re onto a good thing, neither slavishly mimicking their past or pushing too far from what their fans love. Forgotten Horror, Aeon of the Shadow Goddess. Does it for me. I am enjoying discovering some of the bands on this list. Great job! Intrinsic #2!!! That is so awesome! We are so grateful. Thanks!